Sales of the Apple TV are estimated to have grown by 80 percent in 2013, reaching around 10 million units for the calendar year, or some $1 billion worth of set-top boxes sold to end users. Estimated Apple TV sales since 2007. Chart via Horace Dediu of Asymco. Apple Chief Executive Tim Cook revealed during his company's annual shareholder meeting on Friday that total sales of the Apple TV topped $1 billion in 2013. Priced at $99 each, that would mean sales were beyond 10 million for the year. In response to the new data released by Cook, analyst Horace Dediu of Asymco took to Twitter to reveal he estimates that sales of the Apple TV have increased by 80 percent year over year. That would make the Apple TV the company's fastest-growing hardware product. Apple CEO Tim Cook admitted Friday it's hard to continue referring to the Apple TV as a "hobby" with more than $1 billion in sales in 2013. Given the success of the Apple TV last year, even without an update to the diminutive streaming device, Cook admitted it's tough to continue to call the set-top box a "hobby" anymore. For years, Apple has famously referred to the Apple TV with that identifier, suggesting that it does not see the product as a major revenue driver in the same fashion as the iPhone or iPad. 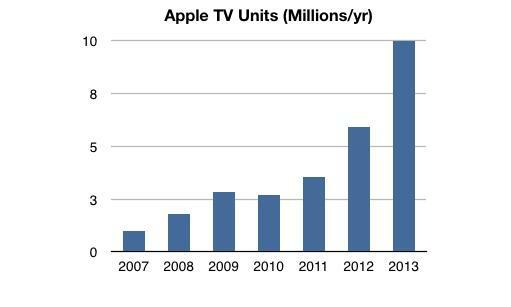 Dediu estimates that 28 million Apple TV units are around $3.5 billion, with 28 million units sold since 2007. If the Apple TV is included in total iOS device sales for 2013, Apple shipped about 250 million units running iOS last year. Cook's announcement comes the same day that Apple has launched a new promotion providing a free $25 iTunes gift card with the purchase of a new Apple TV in the U.S. Given that the device hasn't seen a hardware upgrade since early 2012, it's been taken by some as a sign that a new model could be revealed in the near future. Bloomberg supported that assertion earlier this month, when the publication claimed that a new Apple TV is set to be introduced in April. Unnamed sources suggested that while Apple may show off a new device, it's not expected to go on sale to the public until later this fall, implying that it could be a significant revision of the current third-generation Apple TV. Over the last year, Apple has been steadily adding new channels to the Apple TV, offering users new ways to access high-definition content on their television. Despite this, there is still not a formal App Store for the Apple TV —something a vocal subset of users have been clamoring for since the redesigned, iOS-based set-top streamer became available.